Each refinery can refine up to 25,000,000 gallons of crude per turn. As you get more net worth, you will want to refine more crude per turn, so buying refineries is necessary. If, however, you need quick cash and you have more than 1 refinery, selling refineries is a quick way to get it. 4. Refinery Cost: The amount of cash you need to purchase a refinery. 5. Refinery Price: The amount of cahs you will receive if you sell a refinery. 6. Maximum to Buy: The maximum number of refineries you can buy this turn. This factor is based on how much cash you have available. 7. Refineries: The number of refineries you own. Each refinery can refine up to 25,000,000 gallons of crude each turn. 8. Refinable Gallons: The amount of crude you can refine in this turn. This is equal to the number of refineries times 25,000,000 minus any crude you have already set up to refine this turn. 9. Storage Units: The number of storage units you currently own. Each storage unit can store up to 15,000,000 gallons of crude or products. For information on renting storage and crude reposession, click here. 11. Refineries Bought: The number of refineries you bought this turn. 12. Refineries Sold: The number of refineries you sold this turn. 13. Buy Refineries button: Click this button to buy refineries. See Buy / Sell Refineries below for more information. 14. Sell Refineries button: Click this button to sell refineries. See Buy / Sell Refineries below for more information. 17. Buy / Sell Refineries Graph: Displays the trend of refinery prices over the past 12 months. This white line represents the buying price of refineries, while the blue line represents the selling price. To highlight a particular line, click on legend display on the right for the line you wish to highlight. To hide a line, right-click the legend display for the line you wish to hide. To buy refineries, click on the Buy Refineries button. 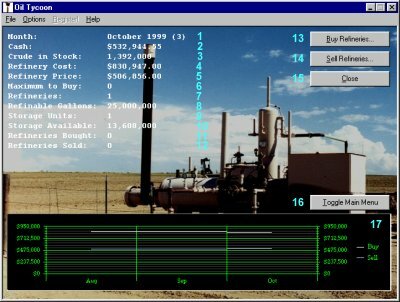 The graph at the bottom of the screen will be replaced by a place where you can specify how many refineries you want to buy (shown below). Type in the number of refineries and click OK. It will take 1 turn before you can start using the refineries. To sell refineries, click the Sell Refineries button and follow the same process. You will receive the cash in 1 turn.